Soil respiration (SR) is one of the largest contributors of terrestrial CO2 to the atmosphere. Environmental as well as physicochemical parameters influence SR and thus, different land use practices impact the emissions of soil CO2. 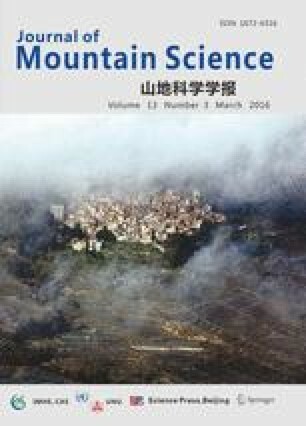 In this study, we measured SR, bi-monthly, over a one-year period in a terrace tea plantation, a forest tea plantation and a secondary forest, in a subtropical mountain area in Xishuangbanna, China. Along with the measurement of SR rates, soil characteristics for each of the land use systems were investigated. Soil respiration rates in the different land use systems did not differ significantly during the dry season, ranging from 2.7±0.2 jumol m−2 s−1 to 2.8±0.2 jumol m−2 s−1. During the wet season, however, SR rates were significantly larger in the terrace tea plantation (5.4±0.5 umol m−2 s−1) and secondary forest (4.9±0.4 umol m-2 s-1) than in the forest tea plantation (3.7±0.2 umol m−2 s−1). This resulted in significantly larger annual soil CO2 emissions from the terrace tea and secondary forest, than from the forest tea plantation. It is likely that these differences in the SR rates are due to the 0.5 times lower soil organic carbon concentrations in the top mineral soil in the forest tea plantation, compared to the terrace tea plantation and secondary forest. Furthermore, we suggest that the lower sensitivity to temperature variation in the forest tea soil is a result of the lower soil organic carbon concentrations. The higher SR rates in the terrace tea plantation were partly due to weeding events, which caused CO2 emission peaks that contributed almost 10% to the annual CO2 flux. Our findings suggest that moving away from heavily managed tea plantations towards low-input forest tea can reduce the soil CO2 emissions from these systems. However, our study is a case-study and further investigations and upscaling are necessary to show if these findings hold true at a landscape level.